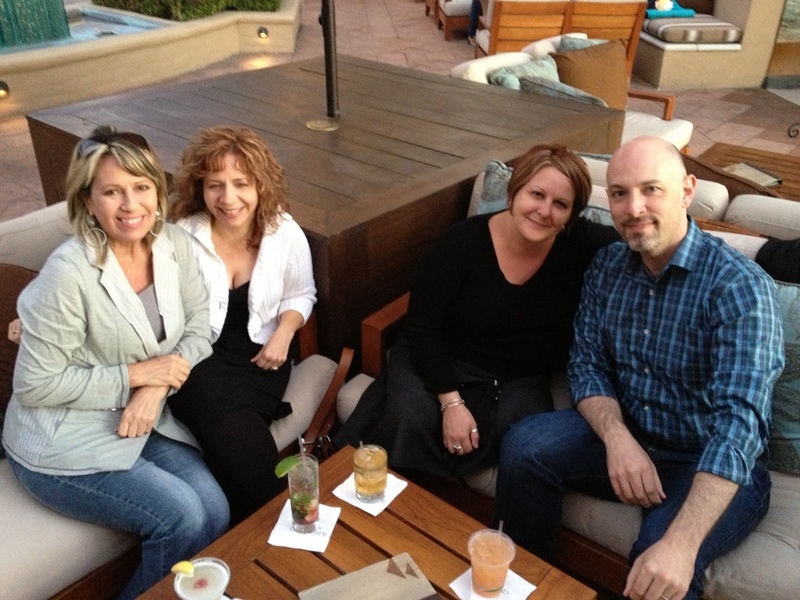 The final portion of my trip to the US was for work, meeting colleagues in Orange County south of Los Angeles. We had decided beforehand to extend the trip for an extra two days as a few of my colleagues had been to Catalina Island before and wanted the rest of us to join them for another trip. Relaxing with colleagues after a long week. 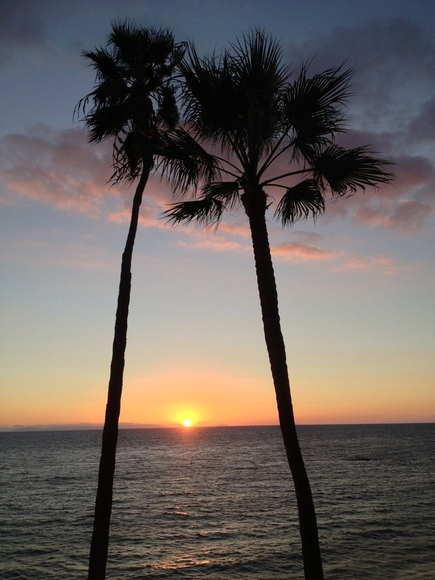 We went to a nice resort in Laguna Beach called Surf and Sand, arriving just at sunset to enjoy a few drinks (I was designated driver) and to nibble on some food. The sunset view from the outdoor lounge, just about the most beautiful sunset photo I’ve ever taken. It is now wallpaper on my phone. We left the following morning for a day trip to Catalina Island, which is about an hour’s boat ride off the Orange County coast. This is a view of the pier at Newport Beach, near where we departed. I’m of mixed opinions about the panorama mode on the iPhone but think it does capture the sweeping views pretty well. Because one of my colleagues did not buy her ferry ticket online early enough, we had to arrive at the pier at approximately 7:00 so she could put her name on the wait list. Too early for a Saturday! 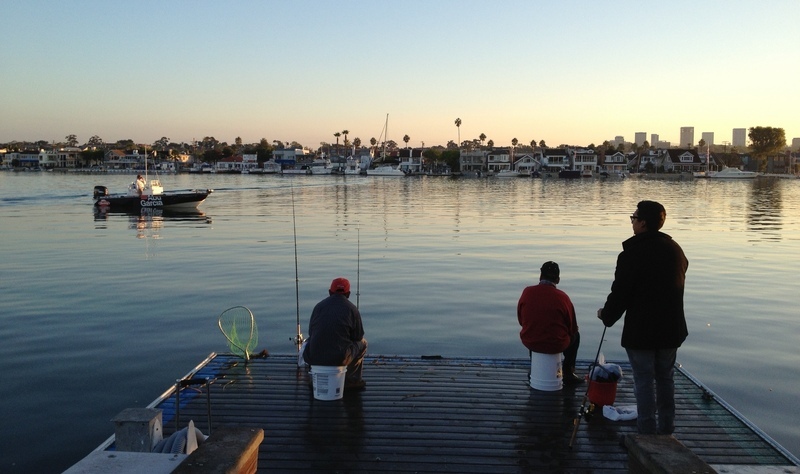 I did get this nice view of some locals fishing in the harbour across from Balboa Island, though. 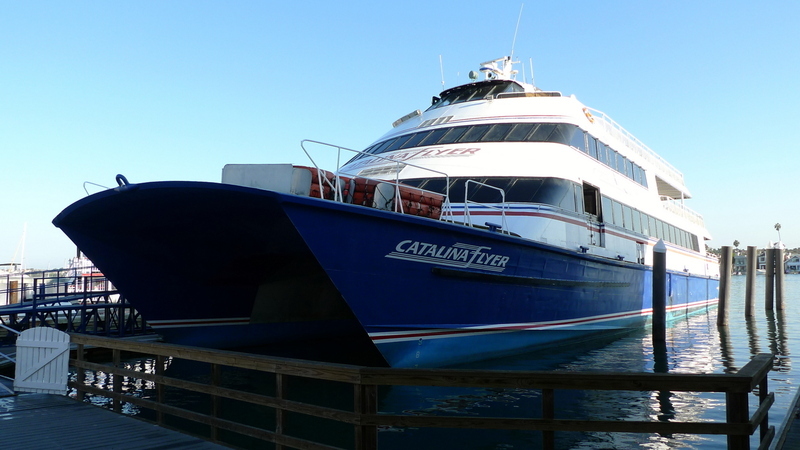 The Catalina Flyer, the catamaran that took us across the channel and to Catalina Island. It held several hundred passengers and was a smooth ride. View of the harbour in Avalon, the only town on Catalina Island. There are many boats anchored in the harbour although I don’t know if they are people who live on the island or people who have sailed from the mainland. At the far end of the harbour, kind of hard to see in this picture, is a lovely Italianate style building called the Casino. If I understand correctly, it used to be a ballroom. The Casino is pictures on the right side of this picture. The view is of an area known as Descanso Beach, just to the north of the Avalon harbour. We staked out a table with a view over on the left side of the picture and spent a few hours drinking (again, me sticking to iced tea) and nibbling on food. There was also a fair amount of shopping, all of which seemed to be for ticky-tacky touristy items. Not my scene, but that’s okay. The ferry home. Many people were drunk and talking loudly. The ocean breeze felt lovely, though. In the evening, we went for dinner after stopping in to visit another colleague who had been hospitalized during the week with pneumonia. Thankfully, she is recovering. This entry was posted in Uncategorized and tagged California, Catalina, ferry, Italand, Southern by christao408. Bookmark the permalink. 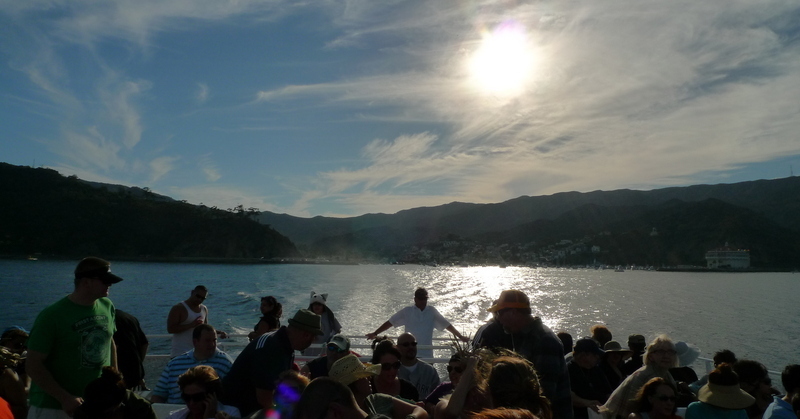 Nice scenic photos and I miss Catalina! Catalina is beautiful. I will go back there to visit again. You have a great eye for photo composition. Welcome to the OC. I can’t get my wife to go to Catalina, she won’t get on any boat because of motion sickness, but maybe I’ll go anyway some day. A gorgeous sunset shot, Chris! Catalina is a beautiful spot — its culture is somewhat kitschy. In the big band era, the Casino was a hugely popular spot, with the entire upper floor of that building a huge ballroom, and museums and offices below. It has been restored, and is beautiful, but without the big bands it’s not so heaavily used as it was. I think at least half of those boats in the harbor are mainland sailors — I’ve seen shots of the harbor almost empty! Looks like such a beautiful place to be. These photos are definitely making me long for some sun and sand now that the rain has kicked in! Beautiful shots and the sunset and last photo are my favs and are amazing. Your Iphone takes great photos. beautiful sunset and so artistically captured by you. i was happy to read Janet’s comment regarding the island. the sunset pic is a BEAUT!! The pictures turned out nicely, and you’re looking very well! Ah, that looks gorgeous ! Glad you had a good time. @slmret – I saw a poster for some swing dance competition to be held at the casino in November. That would be like traveling back in time! @secade – Oh, thank you. I felt a bit bloated by the tail end of the trip! @ZSA_MD – Yes, Janet is my go-to person for Southern California knowledge. @Grannys_Place – The iPhone really does a lot better with photos than I would have imagined, although I’m not going to give up my Panasonic quite yet. It does better with lower lighting situations. @Ricardo98 – Dramamine? @CurryPuffy – @Want2FitIn2Fat2Fit – @rudyhou – @Seductive_Debate_Moderator – @mizz_chan – @Fatcat723 – Thanks for the comments and I’m glad you liked the photos. It was a gorgeous day. I’ve never been to Catalina before. Love the pictures and the panormaics are lovely! Glad you had a good time. Hi Chris, I miss seeing your beautiful photos. I love that sunset photo. I heard from Nick that you were in Singapore not too long ago. @icepearlz – Hi there – long time no see! Yes, Tawn and I spent a weekend in Singapore at the start of September. Apologies for not connecting with you while there. @ShadesOfAnnie – @oxyGENE_08 – Glad you enjoyed the pictures. @AppsScraps – I would imagine that spending a weekend on the island, as opposed to day-tripping, might allow you to more fully appreciate the nice aspects of Catalina.